Password Authenticated Key Exchange (PAKE) is one of the central topics in cryptography. It aims to address a practical security problem: how to establish secure communication between two parties solely based on their shared password without requiring a Public Key Infrastructure (PKI). The solution to the above problem is very useful in practice — in fact, so useful that it spawns a lot “fights” over patents. Many techniques were patented, including the well-known Encrypted Key Exchange (EKE) and Simple Password Exponential Key Exchange (SPEKE). A secondary problem is technical; both the EKE and SPEKE protocols have subtle but worrying technical limitations (see the paper for details). At the 16th Workshop on Security Protocols held in April 2008, Cambridge, UK, I presented a new solution (joint work with Peter Ryan) called Password Authenticated Key Exchange by Juggling (or J-PAKE). The essence of the protocol design inherits from the earlier work on solving the Dining Cryptographers problem; we adapted the same juggling technique to the two-party case to solve the PAKE problem. To our best knowledge, this design is significantly different from all past PAKE solutions. Intuitively, the J-PAKE protocol works like a juggling game between two people — if we regard a public key as a “ball”. In round one, each person throws two ephemeral public keys (“balls”) to each other. In round 2, each person combines the available public keys and the password to form a new public key, and throws the new “ball” to each other. After round 2, the two parties can securely compute a common session key, if they supplied the same passwords. Otherwise, the protocol leaks nothing more than: “the supplied passwords at two sides are not the same”. In other words, one can prove his knowledge of the password without revealing it. A Java implementation of the protocol on a MacBook Pro laptop shows that the total computation time at each side is merely 75 ms.
We hope this protocol is of usefulness to security engineers. For example, compared with SSL/TLS, J-PAKE is potentially much more resistant against phishing attacks, not to mention that it is PKI-free. Since this protocol is the result of an academic research project, we didn’t — and have no intention to — patent it. As explained in the paper, J-PAKE even has technical advantages over the patented EKE and SPEKE in terms of security, with comparable efficiency. It has been submitted as a follow-up to the possible future extension of IEEE P1363.2. We believe the PAKE research is important and has strong practical relevance. This post is to facilitate discussions on this subject. The paper can be viewed here. Any comments or questions are welcome. 2008-11-04: a more refined J-PAKE in C and OpenSSL by Ben Laurie. 2008-11-11: possible applications of J-PAKE in VPN and browser by James. 2009-02-08: public group parameters for 112-bit and 128-bit security can be found in the comments. 2009-03-15: fixed the broken link to the old Java file. Here is the link to the Java demo code. 2010-04-17: a journal version of the paper available on IACR. No technical change to the protocol. 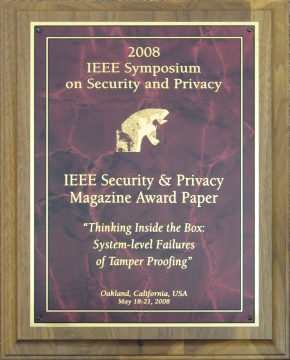 2010-10-25: the journal version of the paper is accepted to publish on the TCS journal – Springer Transactions on Computational Science, the special issue on “Security in Computing”, 2011. 2010-11-25: Sebastien Martini reported an implementation issue of J-PAKE in OpenSSL and OpenSSH. The issue is not applicable to the Java demo code that I wrote. As stated in the last paragraph of p. 11 in the paper, one shall check the element lies within the specified group. Stefan Arentz implemented a fix in OpenSSL. Official OpenSSL and OpenSSH patches can be found here and here. 2011-01-11: Mozilla built J-PAKE into the base product of Firefox 4 ( beta 8 and later). More details here. 2012-01-18: Today, Mohsen Toorani uploadeda paper on IACR eprint to claim several attacks on J-PAKE. My response can be found here. 2012-07-21: Phil Clay contributed a Java implementation of J-PAKE to bouncycastle. 2013-02-24: J-PAKE included into bouncycastle 1.48. 2014-12-26: My response to Mohsen Toorani’s IEEE ISCC’14 paper “Security Analysis of J-PAKE”. 2015-05-08: Standardization of J-PAKE in ISO/IEC 11770-4 in process. The first working draft (WD1) passed reviews by ISO/IEC SC27 at Kuching Malaysia, May 5-8, 2015. 2015-05-19: Here is an independent formal analysis of J-PAKE by other researchers published at Oakland’2015. Their results are consistent with the original J-PAKE paper. 2015-05-31: Firefox is upgrading Sync 1.1 (using J-PAKE to transfer a full-entropy AES key between sync devices) to new Sync 1.5 (using user-defined passwords as encryption keys). But Pale moon decides to stay with Sync 1.1. 2015-07-28: the Thread Technical white paper is public. It describes a technique that securely enrols a new device to the network based on J-PAKE. The technique is used in Google Nest thermostat products. 2017-10-06: J-PAKE published in ISO/IEC 11770-4 as an international standard and also published in RFC 8236. See here. Last month, on the 4th April, I published a document describing how the Phorm system worked and blogged about what I thought of the scheme. The document had been run past Phorm’s technical people to ensure it was correct, but — it turns out — there were still a handful of errors in it. A number of helpful people pointed out that I’d misdescribed third-party cookies (which didn’t matter much because Phorm specifically uses first-party cookies), and I’d managed to reference RFC2695 rather than RFC2965 ! In my original document, I’d waved my hands a little bit about how the system worked if people had blocked cookies for specific domains, and so I swapped some more email with Phorm to better understand, and then published a revised version on 23rd April — so that the correct information would be available to accompany FIPR’s press release and paper on the various laws that the Phorm system breaks. However, there was one final thing that wasn’t dealt with by press time, and that’s now been explained to me…. The Phorm system does some of its tracking magic by redirecting browser requests using HTTP 307 responses. When this was first explained to me at the meeting with Phorm there were two redirections (a scan of my notes is here), but having thought about this for a while, I asked for it to be explained to me again later on, and it turned out that I had previously been misled, and that there were in fact three redirections (here’s my notes of this part of the meeting). It now turns out, following my further emails with Phorm, that there are in fact FOUR redirections occurring! This is not because my notes are rubbish — but because Phorm have managed to recall more of the detail of their own system! The user wants to visit www.cnn.com, but their request does not contain a cookie (for www.cnn.com) with a Phorm unique identifier within it. They are redirected (ONE) by the Phorm system to www.webwise.net. The user visits webwise.net by following the redirection. If they do not have a Phorm identifier cookie, then they will be issued with a new identifier and redirected (TWO) elsewhere on webwise.net. The user visits webwise.net for the second time. If they still don’t have a Phorm identifier cookie then their IP address is marked as wishing to opt-out and they will be redirected to www.cnn.com and they won’t be redirected again for at least 30 minutes. If they do have a cookie (or if they had one at the previous stage) they are redirected (THREE) to a special URL within www.cnn.com. The user visits the special URL, which the Phorm system redirects to a fake version of www.cnn.com that sets a www.cnn.com cookie with their Phorm identifier in it, and redirects (FOUR) them to the URL they wanted to visit all along. For the moment, this appears to be the grand total; there can be up to four redirections, and it is deducible from this description what happens if you refuse (or delete) cookies in the webwise.net and www.cnn.com domains. It is also apparent that if you resolve webwise.net to 127.0.0.1 that you’ll never get past the first redirection; and you will need to rely on the Phorm system spotting these repeated failures and turning off redirection for your IP address. direct adjective: Straightforward in manner or conduct; upright, honest. indirect adjective: Mechanism by which Phorm fools your system into accepting tracking cookies from third-party websites, even when those websites promise never to track you!